Crime data from Neighborhood Scout indicate the chances of becoming a victim of property crime in Maryland is 1 in 43, below the national median. And yet more than 30% of business failures can be traced to crime, according to the US Chamber of Commerce. Good reason to be certain your security and surveillance system is up to date. 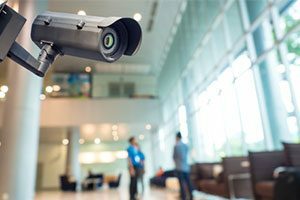 Especially for large commercial enterprises like shopping malls, apartment complexes, universities or other multi-building commercial complexes, the need for reliable security has taken on new importance in these modern times. Maybe you’ve experienced a break-in of some sort or the instance of crime has increased in your neighborhood. Maybe it’s time to take your security to the next level. So how do you know when you need a security update? How old is your current alarm system? If your current system assuming you have one) is more than a few years it’s likely not taking advantage of the latest technology. The best systems will embrace mobile management, environmental threat detection for things like carbon monoxide, heat, and water, as well as consider infrastructure threats to your facilities posed by terrorist-like attackers. Call ARM for a free assessment of your current system. Do you have a visitor access policy? Ensuring the security of your space involves protecting people and property. You cannot sufficiently do that without a rigid access control policy. Does yours include a central registration area with a sign-in and -out sheet? Do your employees understand the policy and adhere to it? What about ID badges? Is it electronic and include various access levels of restriction? If not, you need an upgrade. What kind of keys do you use? If your employees are still using old-school metal keys to lock doors and restrict access, you’re missing the boat. Modern security systems take advantage of electronic ID cards and key fobs which not only provide levels of access and restriction but record entry and exit data. A metal key can’t do that. Does your current monitoring routine have gaps? Perhaps your security uses a combination of security cameras and security guards. Does this pose vulnerabilities when a guard is off-post or distracted? Are there visibility gaps in your camera surveillance? High-end solutions will combine mobile video monitoring with motion intrusion detection, and even facial recognition. What does your employee password system look like? Today, both physical and cybercrime threats are often the result of an internal vulnerability. Internal threats can result from an employee with a poor password practices or insufficient security measures. Strict password guidelines and policies will improve your security posture. So, now that you’ve determined you need a security upgrade what do you do? ARM Security Solutions will provide a free consultation of your current system and advise you on what can be reused, upgraded or needs to be purchased new, based on your budget and requirements. This area of concern includes what’s happening at your site when people are there and when they are not supposed to be. It can help businesses with inventory and loss prevention, insurance issues, crime prevention and prosecution. Surveillance is also a key factor in protecting employees from the illegal or unauthorized entry of intruders. Access must be controlled in two areas: physical and digital. The control of physical space ensures the protection of your people, your property, and physical assets as well as the building and infrastructure itself. Digital access control protects your company’s intellectual property, proprietary and financial data, personal privacy, and reputation. This area of concern includes your traditional fire and burglary alarm systems, fire sprinklers, smoke and carbon monoxide detectors, lighting and building safety issues and emergency response measures. So, when looking for a high-end, state-of-the-art integrated security system it should include video solutions, CCTV surveillance, burglary and fire alarms, electronic access control and central monitoring.